Clarenville is the lone top-20 finalist from Newfoundland and Labrador in the Kraft Celebration Tour. If they get to the top-10 they will win $25,000 to upgrade Elizabeth Swan Park. 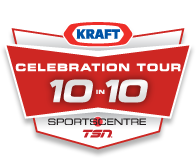 The top-10 will be chosen by votes so starting 1:30pm today Tuesday July 10 visit kraftcelebrationtour.ca and cast your vote for Clarenville. Voting will be open for 24 hours and you can vote as often as you want.